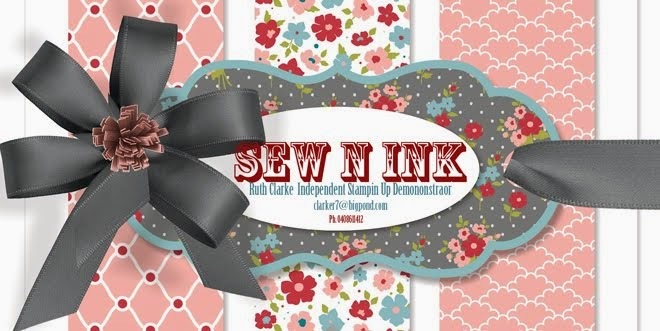 It's that time of the month where JUST ADD INK- Just Add Scrapbooking introduces another scrapbooking challenge for the month of March. 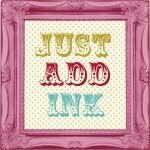 Just Add Altered Art -3D Scrapbooking. I guess this is thinking a little beyond the page tradition- where you find something and reinvent its use to an artistic form or alter an existing item, somewhere along the way include a photo or so to incorporate the 'Scrapbooking' aspect. I've made this little frame as a pressie for my parents, they have been married for almost 49 years!!! I've incorporated a 'Dolly peg' and 'altered' its use by decorating it as an embellishment on this project. I also 'altered' the chipboard by covering it with some DSP- Everyday enchanted, stamping the stamp design on each corner and than running it through the Big Shot using the Top Note Bigz Die. Firstly I cut out an oval design from the centre of my patterned paper and than positioned the photograph to the back and adhered it permantly, than placed some Sixxiz Sticky Paper to the back of the patterned paper and peeled the backing off, sticking it to some chipboard and running it through the Big Shot using the Top Note die. On the back (before I permanently adhered them the magnets -hence the crookedness LOL!) I stuck 2 clip magnets to the back of my project and now they will stick to any metal surface. 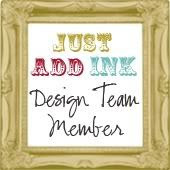 Ok so why not join in and see what you can be inspired to try- check out what the team has done just click on the badge and discover! 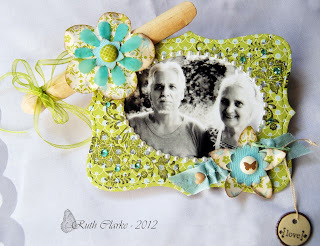 Love everything about this little project, Ruthy - it is so special. Gorgeous colours, and all those glorious little embellishments are soooo cute! Ruthy this is beautiful and something I am sure your parents will treasure. A great gift idea. I just love your project Ruth! The colours are gorgeous and I am sure your parents will love it.